Appraisal Scoop: Calculating the Gross Square Footage of Living Area: Simple, Right?! Calculating the Gross Square Footage of Living Area: Simple, Right?! As appraisers we analyze everything, including how the square footage of a property is measured and calculated. In most cases, we’re providing an appraisal to meet secondary market guidelines, and most commonly Fannie Mae and Freddie Mac. 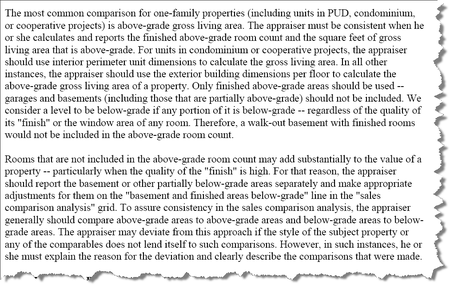 So let’s look at how Fannie Mae guidelines define GLA, or Gross Living Area. Then there is Gross Building Area or GBA: Gross Building Area sometimes can be the same as GLA (Gross Living Area) and is especially true for single family homes. However, in a multi-family residence there maybe common areas that would not be considered living areas, but part of the size of the structure. The major difference between single-family GLA and GBA in a multi-family is what is actually used as living space (or rented out GLA) and how big the building is (or GBA). So that is pretty simple, not tough at all. 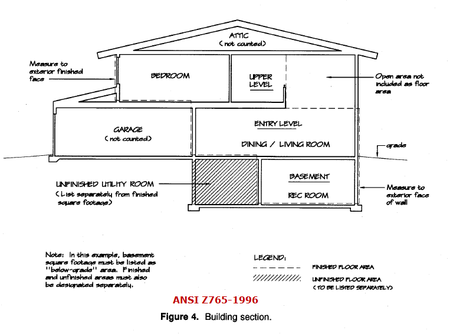 Square footage calculation of single family residence by the American National Standard Institute or ANSI has a slightly different approach. ANSI standards have been adopted by most MLS services and real estate agents. 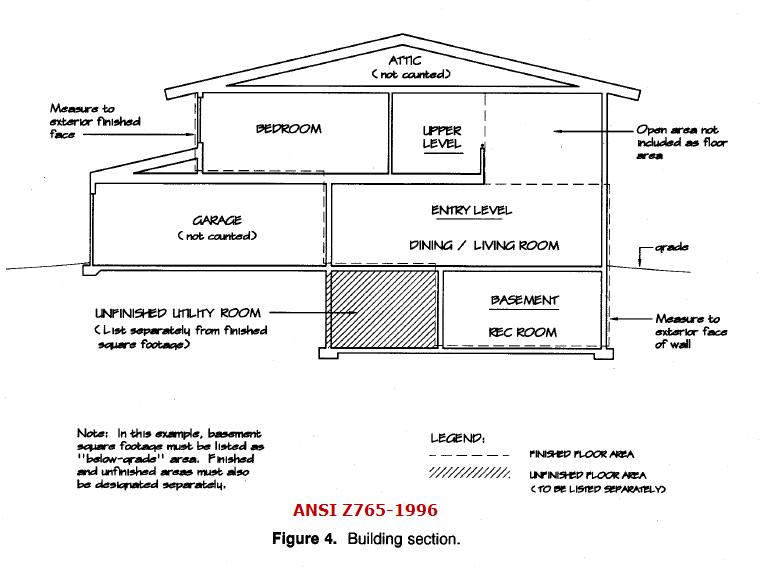 ANSI looks at the outside dimensions, but also may "extract" a few areas in the interior and provides some additional guidance when it comes to unique properties. For detached single-family houses, the finished square footage of each level is the sum of finished areas on that level measured at floor level to the exterior finished surface of the outside walls. Openings to the floor below cannot be included in the square footage calculation. However, the area of both stair treads and landings proceeding to the floor below is included in the finished area of the floor from which the stairs descend, not to exceed the area of the opening in the floor. Whoops, Lets read that one again: So while Fannie Mae guidelines would include open area ( such as the stair well and cathedral area over living room, in their determination of GLA, ANSI standards does not. There is a simple reason for that: Fannie Mae wants the appraiser to measure the GLA of the subject consistently with how the GLA is measured on the comparables. Since appraisers do not get in to inspect the interior of the comparables they can not determine open area from non-open area. Again open areas are included in GLA defined by Fannie Mae, but are not included as determined in GLA as defined by ANSI standards. The above-grade finished square footage of a house is the sum of finished areas on levels that are entirely above grade. The below-grade finished square footage of a house is the sum of finished areas on levels that are wholly or partly below grade. Fannie Mae and ANSI are both consistent with this definition. Any level that is partially below grade makes the entire area ineligible for being determined in GLA. 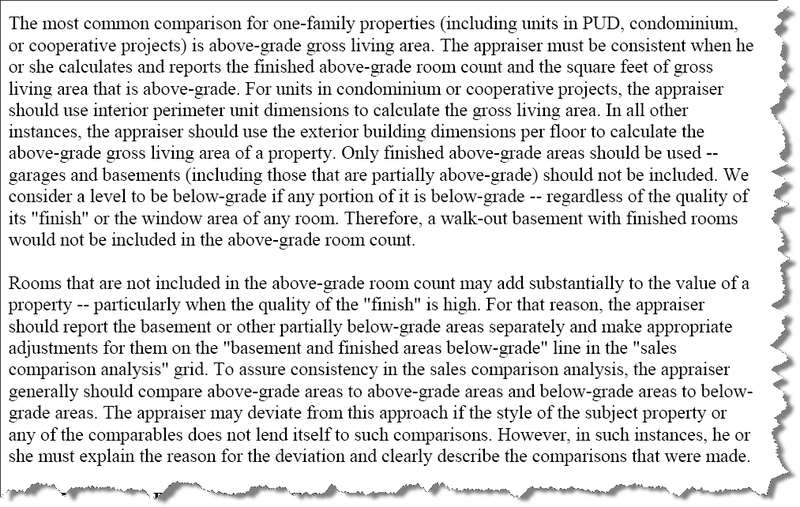 So as long as the appraiser can define consistent comparables with below grade and above grade areas, and they give reasonable cause, below grade areas can be included. To be included in finished square footage calculations, finished areas must have a ceiling height of at least 7 feet (2.13 meters) except under beams, ducts, and other obstructions where the height may be 6 feet 4 inches (1.93meters); under stairs where there is no specified height requirement; or where the ceiling is sloped. If a room’s ceiling is sloped, at least one-half of the finished square footage in that room must have a vertical ceiling height of at least 7 feet (2.13 meters); no portion of the finished area that has a height of less than 5 feet (1.52 meters) may be included in finished square footage. Again, Fannie Mae differs because they are considered with the accuracy of an analysis not necessarily the particulars of a property. That is not to say, if the appraiser is aware of an inconsistency or unique property, they are not to take it into consideration. For example: Two Cape Cod style homes - 24 feet wide with a full dormer on one side. The width on the second floor may be 20 feet. Four feet has been taken away from the width of the second floor to accommodate or meet the requirements that GLA is defined as a minimum of 5 feet. Yet we know that some homes may have been finished off to accommodate 6 feet of living area, creating additional eve storage but reducing living area. In this particular situation, GLA would be different based on ANSI standards which would eliminate that area, and Fannie Mae, which is based on the exterior measurements, would include this area. Again, how would an appraiser know if a comparable only had 18 feet wide living area on the second floor if they had not inspected the interior of the comparable sale? The emphasis is on consistency for the purpose of estimating value then on ANSI standards that appears to be primarily concerned with walking space. Finished areas that are connected to the main body of the house by other finished areas such as hallways or stairways are included in the finished square footage of the floor that is at the same level. Finished areas that are not connected to the house in such a manner cannot be included in the finished square footage of any level. Where finished and unfinished areas are adjacent on the same level, the finished square footage is calculated by measuring to the exterior edge or unfinished surface of any interior partition between the areas. NOW: Assessors, Insurance Agents, Architects, Contractors and Mobile Home dealers all have different ways of measuring a property. A prime example is assessors may measure a New England home as 1.75 story building while the exterior measurements and the interior measurements and ceiling height measurements may constitute the property being a full 2 story building. It does get confusing for the un-trained. So, it's no wonder that many real estate agents opt not to measure the property, but take the information from a secondary source. However that secondary source may not be the best representation of the property for an MLS listing. The best source is someone that knows the differences and understands what sales agent's obligations are . . . An APPRAISER!